I have heard people say, "If I had a million dollars I would be happy." Others have said, "If I could have my health back, I would be happy." Feelings follow thoughts. The feeling does not precede the thought. In order to have a feeling, or emotion, there must have first been a thought. Thoughts pass through our minds very quickly, even without us being aware. Are you aware of your thoughts and the emotions that arise in you as a reaction to them? If you find yourself feeling sad or frustrated, what were you thinking before you had the feeling? Find the connection. Then you can go back and change your thoughts. You can begin to think differently. It is not our health or our seeming lack of money that causes what we are feeling. It is our thoughts about the situation. Even with a stack of bills on your desk and no money to pay them, you can change your thoughts and thus your feelings. Practice it. And as we change our thoughts and develop a more positive attitude, our life begins to change for the better. Try it and share your results with me. I have an exercise for you to do--no, not that kind. It won't burn off calories, but it will answer some questions for you. Find a sheet of paper and make a list of all the things you love to do. Make the list as long as it needs to be. Now that you have your list, take the least important thing you love to do and cross it out. Keep going now and take the next least important thing off, and continue this exercise until you have one thing left that you love to do. What happened to Leif Garrett? Recently I came across these pictures of Leif Garrett. When I was in college in the 70's, I had a class in popular culture. Leif Garrett had just appeared on the scene and we talked about his androgynous good looks and his popularity. And here he is, 30 years later, a man bearing the marks of drugs and alcohol and life on the streets. What happened? My niece is now serving time in prison because of her addictions and unwise decisions. Back in the 80's, her four year-old son was playing with another four year-old boy that my niece was babysitting for a friend. The boys wandered off and found an abandoned refrigerator. They climbed in, shut the door, and suffocated. My niece couldn't deal with the grief and guilt of losing her own son and the guilt and responsibility she felt for the death of her friend's son. She spiraled downward. Drugs, alcohol, stripping, prostitution, men who abused her. It led to her being arrested several times and serving time in prison. She is getting help in prison in a program that is helping her come to terms with the unresolved guilt and grief that she blocked all those years. It's now time for her to feel them and it isn't pleasant--but it is necessary. Who knows what happened to Leif Garett. I hope that he finds the help that he needs and is ready to do what it takes to recover. Tithing is a spiritual principle that many religions teach, although not all of them call it tithing. Some people get upset when their minister mentions tithing, thinking that it is just a ruse to get more money for the church. Tithing is based on the law of circulation. You've probably heard the expression...what goes around comes around or what you give comes back to you multiplied. Have you ever left your home with a negative attitude and found that the more you expressed that attitude in your words and deeds, the more people expressed it back to you? Tithing is about giving ten percent of our income to the people or organizations where we get our spiritual food, but you can also tithe your time and talent. The attitude in which we tithe is also important. Some people give because they feel obligated to or because they want to get something back. Tithing from an attitude of gratitude is best. If we give realizing all that we have already received, we give with an open heart. The law tells us that we can expect to receive something back, but we don't focus on that. We give in love and gratitude and because we want to, not because we have to or because a minister or teacher tells us to. A survey done by the University of Chicago reports that people are unhappier today than in 1991. The report noted that significant negative life events had increased from 88% of respondents to 92% of respondents. Most of the events had to do with health challenges and lack of medical insurance, unemployment, and relationship problems. More people are unable to afford or obtain health insurance today than in 1991. On the other hand, an associate professor of psychology at the University of Virginia has written a book called The Happiness Hypothesis. In his book, he writes that our level of happiness has to do more with our brain than with the events that happen to us. He believes that happiness is like a thermostat and that we all have a set point that is determined by genetics. I do believe that hormones and chemicals, such as serotonin, can affect how we feel. But I also believe that our thoughts determine how we feel as well. People who have a spiritual belief system and/or who have a positive outlook on life, tend to be happier from other research that's been done than those who have no spiritual beliefs or who do not approach life with a positive outlook. I believe that we can raise our "set point" by focusing on the positive aspects of our life and believing that regardless of the challenge that we may be facing, that there is good to come out of it. If you're feeling a little blue today, check out my "Smile Awhile Photo Album." There are some pictures guaranteed to make you smile! The question has been asked many times, "Do animals feel love?" There is no way to prove it, since you can't ask them. But having experienced the love of many animals in my life, I say unequivocally, "Yes, animals feel love." And they express it too, as those of us who have pets know. My friends, there is yet another hostage facing execution by insurgents over in Iraq. 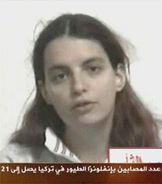 Jill Carroll, a 28 year-old reporter for the Christian Science Monitor, has been held captive now since January 9. Jill was against the American occupation of Iraq and has consistently written about her concerns for the Iraqi people. She has opened her heart to them and they have invited her into their homes. Now is the time for us to join together in prayer for this young woman and for peace in our world. Each person in this world has the light and the love of God within them. But many have forgotten who they are. It is now time for us all to pray and to see that light that is so easy to see in Jill--now see it in her captors. Know that they will come to the awareness that it is within them. Pray that they will see that we are all of one race--the human race--and we are all one people. Pray that their hearts may soften and that they will do the right thing--release Jill Carroll. You who read these words are the light. You are God expressing in the world. Let your light shine now. You are needed. You are important. For a reminder and for inspiration, I invite you to watch the short movie, "You Are The Light." Click on the link below. There's been a lot of controversy lately about James Frey's book, A Million Little Pieces. I was reading it when the news came out that he had fabricated or embellished some events and situations in his book. Since the book is a memoir, and supposed to be factual, it left people wondering "What is the truth? Did any of it happen?" Having just finished writing my own memoir, No Dumb Bunny: One Woman's Journey of Self-Discovery (see my web site at www.carlagolden.com), I had to look at my own book and ask the question: Have I been totally honest? The thing about memoirs or autobiographies is that they are your memory of how events occurred. People remember things differently. I sent several chapters of my book to an old boyfriend to read, just so that I could make sure my memories were accurate. He never replied. I sensed that Frey was very honest about his emotions, if not all the facts. I think that regardless of the embellishments, Frey's book still makes for very powerful reading. I have heard people say that anger is bad. I used to think that myself and would try to avoid it. Anger is harmless in and of itself. It is a barometer of sorts of what is going on within us. It is an indicator of what we are thinking. In "Ask and It Is Given" (See Recommended Books), the author has a list of emotions. They are listed according to the vibration they create within us. The lowest producing vibration is fear/grief/depression/despair/powerlessness. It is number 22 on the list. Anger is 17. The highest, or number 1 is joy/knowledge/freedom/empowerment/love/appreciation. The goal is to move up to number 1. We have to get in touch with our feelings to do this. If we are feeling anger, we are a step above revenge and a step below discouragement. But anger is seen as a positive move from despair and depression. Have you ever gotten angry about a situation or condition you were experiencing and vowed that you would change your life? I have. It rousted me from my despair and propelled me forward to take action. If you're feeling angry today, rejoice! You are moving up the ladder. But don't allow yourself to dwell there, and do not lash out in your anger at others. Focus on the upper rungs. (What helps me is to think about the good in my life. That immediately changes my mood and thus my vibration.) Then, from a higher level, you can address the issues in your life that need to be addressed and have the conversations that you need to have with people. While you are feeling the anger is not the time to do it.